Freelance drummer, guitarist and lecturer with many things going on at the same time. 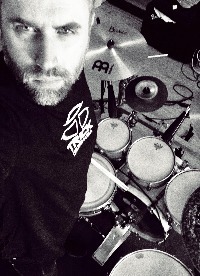 Johan works frequently as a session musician both studio and live in Sweden and abroad. Since 2011 he arranges workshops/clinics in drums and guitar and has written an essay about how click track affects musicians. He runs Rabbit Hole Studios in central Gothenburg since 2011. Johan is since 2011 a permanent member of pioneer Vocal Ensemble Amanda. Clinic - Working as a session musician. Pecha Kucha 2017 - Pannben - The worlds first Cross Fit Live band.